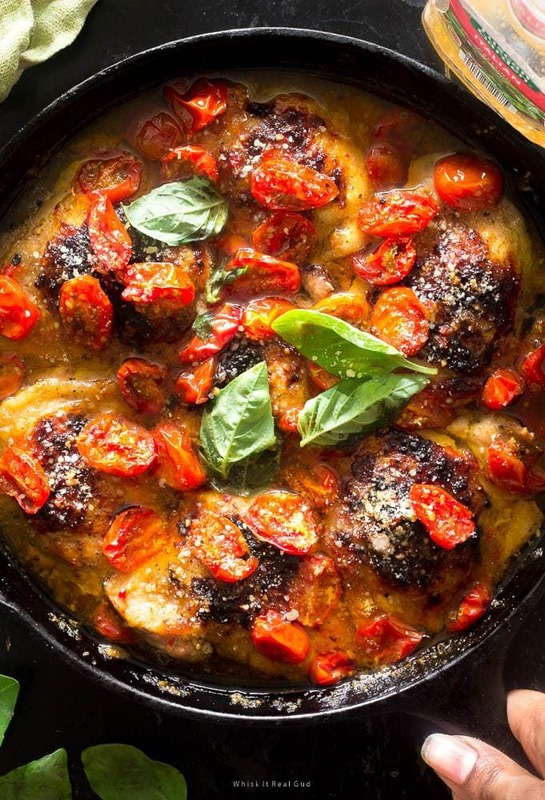 Super easy baked chicken with Italian dressing baked chicken with roasted tomatoes. This one will be ready in no time! No one will believe you used only Italian dressing. This is one tasty budget friendly meal you have to make! To make this keto friendly use an Keto Italian dressing. You may also like these other keto friendly meals, so tender (thanks to a genius and easy tenderizing technique), beef with broccoli with a twist, crispy but tender smothered chicken with bok choy and mushrooms or maybe, cheesy spinach steak rolls, or beef asparagus rolls,or chicken in creamy arugula lemon Parmesan sauce. If you are new to my blog. Welcome! I’m so happy you found me! I’ve been so busy lately but I also have been testing recipes so much these days. What does that mean? It means more recipes for you! I have decided to post 1-2 recipes a week so make sure you subscribe to my blog here http://eepurl.com/biP_dD, so you can be the first to know when my recipes are live on this blog! Thanks! For my new readers, on this blog you will find that most of my recipe can be made using every day essential ingredients like this chicken recipe, which I will tell you all about in a bit. There will be some recipes that will require more patience and maybe a quick run to the grocery store but it’s good to get out of you comfort zone and create new exciting delicious recipes. 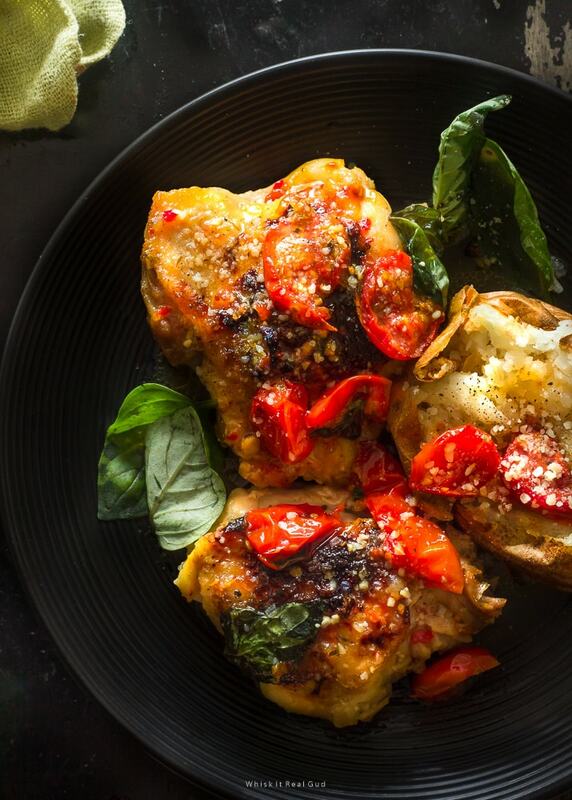 So let’s talk about this amazing EASY Italian dressing baked chicken with roasted tomatoes. Do you have chicken? You can use whatever chicken you have, like chicken breast, skinless or boneless chicken thighs, chicken legs etc (cooking time will vary if you use a different cut of meat). Do you have Italian dressing? Nooooo not Italian dressing mix….I’m talking about the regular ole Italian dressing you drizzle on salad. Tomatoes? A couple ground seasonings like onion and garlic powder? Feel free to use homemade Italian dressing too or any other seasonings you have. Parmesan cheese? This is optional so you don’t have it that’s perfectly okay. This is great without it too! If you answered yes then you can surely make this tonight! If you answered no then run to the store! Hurry! Don’t forget to pick up some french bread while you are there! Toasted french bread with butter is so so good with this! I also love to serve this with a baked potato. I like to drizzle the Italian dressing from the chicken and tomatoes on top of my potato (see photo right above of my baked potato). So darn good and fulfilling! This is the most easiest and tastiest Italian chicken and dressing recipe. Oh, can’t forget cheap and fulfilling too! This baked chicken can be made gluten free and it’s possible to make this a ketogenic but you’ll need to find a dressing that is keto friendly/gluten free or make your own. Are you ready for some Italian dressing chicken??? 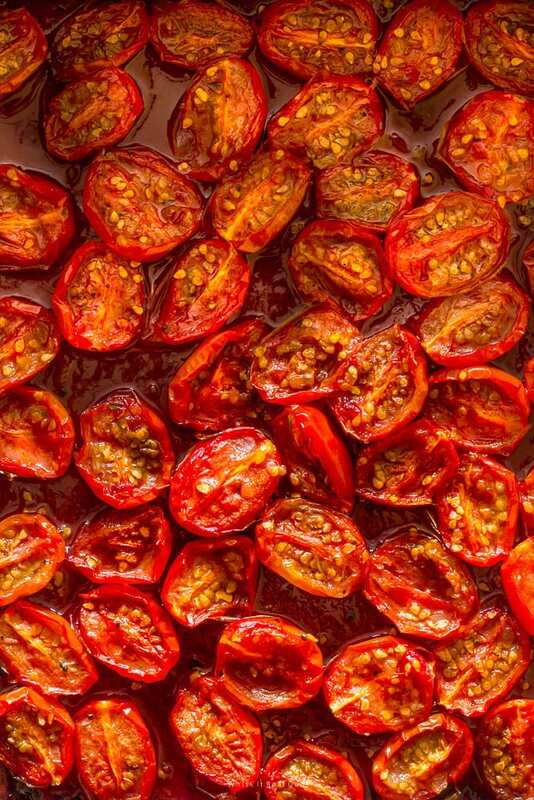 If you are making the roasted tomatoes start prepping them but first Preheat the oven to 350 degrees Fahrenheit. I used a 10 oz package of grape tomatoes which is about two cups of grape tomatoes. All you have to do is line a baking sheet big or smaller 8×8 one with parchment paper. If you don’t have parchment paper you really don’t need it. Just make sure you use a good baking pan. 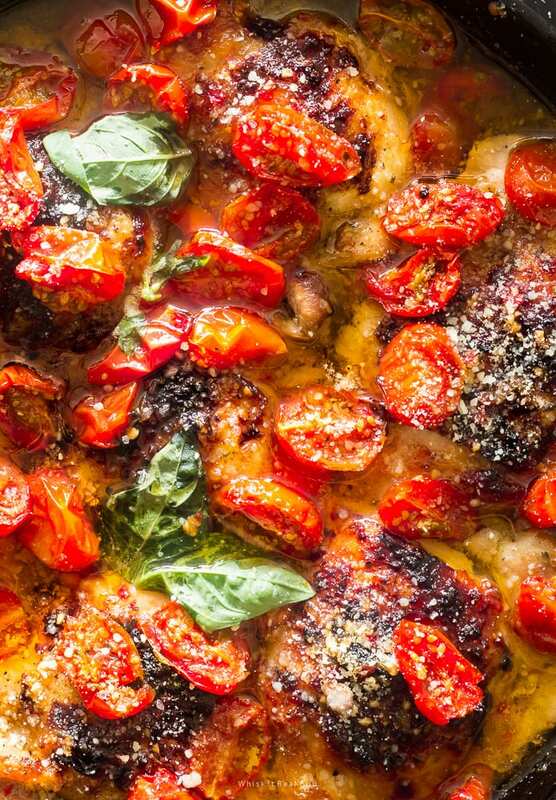 Darker pans without parchment paper may burn your tomatoes. I used a red small ceramic 9×9 pan without parchment paper and the roasted tomatoes came out perfect. Slice all of your grape tomatoes in half. Combine them in a bowl with the dressing a pinch of salt (optional) 1-2 pinches of sugar (optional) and marinate for 10 minutes. I added a couple pinches of sugar because the tomatoes were kind of bitter so in order to balance out the flavor I had to add sugar. You may not have to add sugar. Place the grape tomatoes cut side up in the baking pan. Roast for 25-30 minutes. They are almost done when you see the tomatoes shrivel up some. Make sure to check on them before the 25 minute mark because they may finish faster. So make sure you keep your eye on them. Once the tomatoes are done, set oven to 450 degrees Fahrenheit. Season the chicken with salt, pepper, garlic and onion powder. Heat oil in a large heavy nonstick oven safe skillet over high heat until hot but not smoking. Sear both sides of the chicken for 2-3 minutes. Poke a couple small holes in each of the chicken thighs. Pour the reserved dressing from the tomatoes into the pan plus an additional two cups. Add less dressing if you prefer. Spoon some of the dressing on top of the chicken. Place the chicken into the oven and bake it for 25-30 minutes or until done, basting the chicken occasionally. My friend made this recipe but she also added eggplant and onions. It looked delicious! I have to try eggplant next time. Eggplant is an option too if you don’t care for tomatoes or feel free to add your favorite vegetable. Enjoy! Made this recipe? We want to see it! Snap a photo and hashtag #whiskitrealgud on Instagram! Stay tuned for more Italian chicken dishes. Don’t forget to check out these other keto friendly meals, so tender (thanks to a genius and easy tenderizing technique), beef with broccoli with a twist, crispy but tender smothered chicken with bok choy and mushrooms or maybe, cheesy spinach steak rolls, or beef asparagus rolls,or chicken in creamy arugula lemon Parmesan sauce. Need a plan b recipe? Or maybe you are on a budget and need something to get you through the week? This recipe is perfect for you. School is back in session and I know you need something easy/budget friendly to cook tonight! 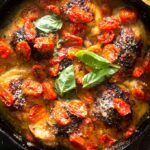 This easy 7 ingredient Italian dressing baked chicken thighs with roasted tomatoes will be ready in no time. No one will believe you only used Italian dressing and a couple of other ingredients. This meal is definitely budget friendly but restaurant quality! **the few essential ingredients like salt, pepper and vegetable oil don't factor in the 7 ingredient count. Roasted tomatoes: Slice all of your grape tomatoes in half. Combine them in a bowl with the dressing a pinch of salt (optional see notes) 1-2 pinches of sugar (optional see notes) and marinate for 10 minutes. Place the grape tomatoes cut side up in the baking pan. Bake for 25-30 minutes. They are almost done when you see the tomatoes shrivel up some. Make sure to check on them before the 25 minute mark because they may finish faster. For the chicken: Set oven to 450 degrees Fahrenheit. Season the chicken with salt, pepper, (see notes) garlic and onion powder. Heat oil in a large heavy nonstick skillet over high heat until hot but not smoking. In an oven safe pan both sides of the chicken for 2-3 minutes. Poke a couple small holes in each of the chicken thighs. Pour the reserved dressing from the tomatoes into the pan plus an additional two cups. Add less dressing if you prefer. Bake the chicken for 25-30 minutes or until done,basting the chicken occasionally. Add Parmesan cheese on top of each chicken thigh. Serve with the roasted tomatoes, toasted and buttered french bread and baked potato. ***I added a couple pinches of sugar because the tomatoes were kind of bitter so in order to balance out the flavor I had to add sugar. You may not need sugar. ***Be careful with the salt since the Italian dressing already has salt. Don't go overboard with the seasonings. You can always add salt once the chicken is done if more salt is needed. mmm. This would be amazing on top of a plate of pasta too! Definitely need to try this! Yup! I bet its’s amazing! Thank you! This chicken looks really delicious and easy to make. I love how it only has seven ingredient. I love how much more flavor you got from the tomatoes! and also lovely photography. This is a really fantastic don’t-know-what-to-cook recipe, it looks incredible. And those roasted toms – I could probably just eat those in a bowl and be happy! Exactly, the tomatoes taste great alone too! Thank you! I love the simplicity of this recipe. Sometimes you don’t need many ingredients to make something amazing. Best way to get the most flavor out of tomatoes… hands down! Your clicks are just amazing and wonderful recipe too! Roasting Tomatoes would add so much flavor! So colorful and looks delish! Man, I don’t even eat chicken anymore and this photo has my mouth WATERING! I think I can sub veggie chikn or seitan for it, because this looks like all of the yum! Haha. Thanks so much Jeni! !